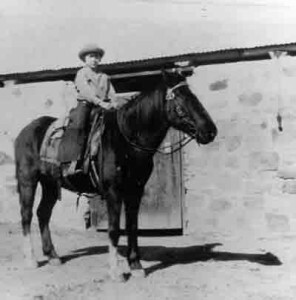 In 2001 I interviewed Dusty Vail, a remarkable woman who grew up in the early 1900s on the Empire Ranch in Sonoita, Arizona, once one of the largest cattle operations in the Southwest. Although she was 86 when I interviewed her, her memory was razor sharp, and the stories she shared with me were full of adventures we can only imagine today. Dusty lived on the Empire Ranch from 1914 to 1927 when the property was sold. She told me she never forgot the lessons she learned during those formidable years when she was able to grow up as a tomboy at a time when little girls were supposed to be quiet and demure. In 1988 Dusty’s childhood home and what remained of the ranch property was acquired by the U.S. Bureau of Land Management (BLM). The Empire Ranch was designated an Arizona landmark in 2000. Since then, the BLM manages the property in partnership with the Empire Ranch Foundation The BLM and the Foundation have been working to restore the ranch buildings for future generations to learn about what life was like more than 100 years ago on a working cattle ranch. Each year an annual public “Roundup” is held on the property to showcase restoration progress. It was an honor for me when Dusty gave me permission to present her stories during these annual celebrations. Before Dusty’s death in 2003, I made a CD of her stories to share with her family and the public. Although I did not plan to do so, a few years ago I was asked to perform Dusty’s stories as a Chautauqua. I had been considering this story performance style for a while, so it was gratifying for me to have an opportunity to explore this art form. This type of storytelling involves becoming the person whose stories are being told. At the end of the show, the performer answers questions in “character,” and then time is given for the audience to ask questions of the storyteller. The Chautauqua is a wonderful experience for everyone involved. It is a memorable way to bring history to life. Last year after I presented Dusty Vail in Chautauqua to celebrate Arizona’s Centennial, a teacher from Ash Creek Elementary, a rural area in the southeastern part of the state, applied for storytelling/history grant naming me as the selected artist-in-residence for the project. I was excited about the idea of teaching students how to bring history to life through Chautauqua performance. The grant application was accepted for funding through the Arizona Commission on the Arts, and I started to think about lesson plans. It may seem like a stretch to be able to include every student in a K-8 school in a Chautauqua performance for the public, but my previous residency work has taught me to expect nothing short of success when working with students. When the grant was written, there were just 21 students in the school, so I knew I would have plenty of time to work with each child and fulfill the goals of the grant. The grant application listed the following student goals to be met. (1) Use acting to effectively represent a character and tell a story in the character’s voice. (2) Develop a script for a narrative performance (grades 3-8). (3) Design support for a performance using theater technology concepts and readily available materials. (4) Collaborate to develop a culminating theater performance. It should be noted that Ash Creek Elementary is an arts integration school. Each year, the school brings in artists from different disciplines to give students opportunities to experience art first-hand. The school’s arts based philosophy provided me with students familiar with a variety of performance styles, so teaching the kids about the art of Chautauqua was an extension of what they already knew. The students at Ash Creek were eager to embrace what I had to teach, and to my delight the teachers provided their wholehearted support by helping make the program a meaningful one.